Juan Ortiz walked through the crowd Monday morning feeling emotional and grateful to be part of the ceremony opening of Teague Terrace, a new permanent supportive housing project. Most of all, he was glad to have a place to call home. 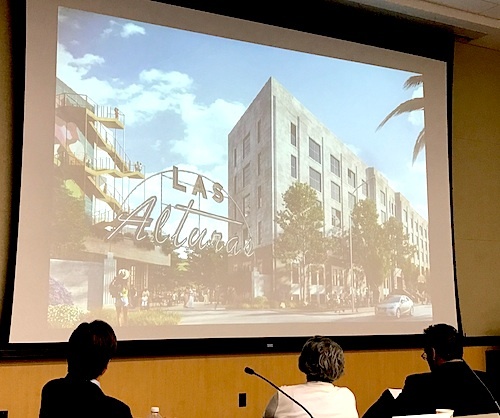 Ortiz lives in one of 56 apartment units in the new housing complex in the border of Glassell Park and Eagle Rock, which actually opened its doors in August. Ortiz told EGP depression and other illnesses caused him to lose his home, bakery business and his family. He spent more than two years living on the streets of Long Beach, until a social worker helped him get back on his feet. The approximately $18 million Teague Terrace is the second Permanent Supportive Housing (PSH) community built by nonprofit developer Women Organizing Resources, Knowledge and Services (WORKS). The nonprofit partners with other groups to make sure people not only have a roof over their heads, but also receive the services they need to make the transition from homelessness to tenant. “We are delighted that this permanent supportive housing is now doing what it was developed to do, house formerly homeless persons and other special needs populations, especially in a neighborhood that has seen the unprecedented impact of gentrification on all income categories,” said WORKS President Channa Grace Monday. For Kathryne Church and Ricky Shapley, getting the keys to their fourth floor apartment has been “unbelievable.” The couple said they had been living in their car for over a year before moving into Teague Terrace. “I still can’t believe I have an apartment,” Church told EGP with a big smile. “We are very happy to have our home,” added Shapley. Each of the apartments is furnished with a bed, sofa, refrigerator and stove. Tenants also received some pots and pans, toiletries and other basic amenities that people living on the streets often go without. “It’s well said that the real works starts when somebody gets a house,” said Cesar Lopez, a team leader with Housing Works, a social service agency partnering with WORKS to provide on-site supportive and enrichment services. From the moment people move in they need help with everything, from furniture to groceries, he explained. We teach them what to buy and what not to buy, Lopez said. Most tenants receive some type of government aid or benefit, such as social security, disability insurance, Section 8 Housing Voucher or other stipend to help pay for their rent, he said. As part of the transition from homeless to housed, social workers teach the new tenants how to manage their money, pay their rent and what they need to do tp keep their housing. “They can live at Teague Terrace for as long as they like, as long as they abide by their lease agreement and stay current with updating their paperwork yearly with the Housing Authority,” Lopez explained. Both Los Angeles County Supervisor Hilda Solis and L.A. City Councilman Gil Cedillo represent Northeast LA and both were on hand Monday for the development’s official opening blessing and ceremony. 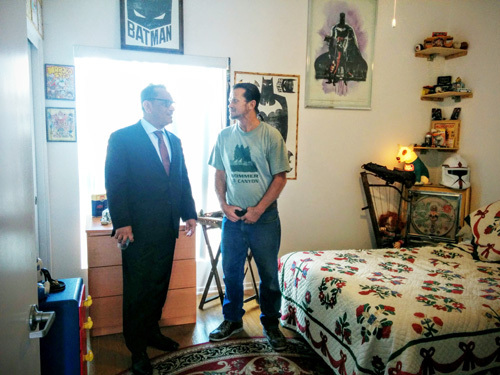 Cedillo called the housing project elegant, well-built and something tenants can have pride in. “I’m so excited to know that people are not only getting a roof over their heads but also of the quality of the commitment from nonprofits and social services to help [residents],” he said. “We really need to call homelessness a state of emergency and stop acting as if it is a business,” said Cedillo, who back in September joined Mayor Eric Garcetti and six fellow council members to announce the city’s plan to dedicate $100 million to help reduce the number of homeless on city streets. The homeless population in LA city and county has risen 12% since 2013, according to the Los Angeles Homeless Services Authority. There’s a need for over 500 thousand affordable units in the county, including over 80 thousand needed to house the homeless, Solis said. Permanent supportive housing projects like Teague Terrace are making a small but important dent in that number. The facility houses 39 formerly homeless people including some veterans, people with developmental disabilities and people who are being helped by the Dept. of Health Services. 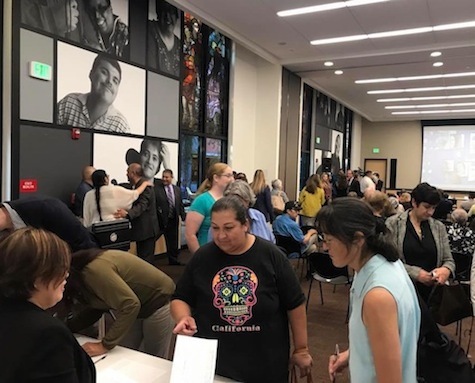 The other sixteen residents are either low-income seniors or small families whose income is at or falls below he Area Median Income, which is $1,300 per month for a single individual, said Lopez. Fifty-eight-year-old Ortiz told EGP he’s working on recovering from his depression and to be OK again.